Having been engaged in beekeeping for several years now, I find that many beekeepers look for a recipe timeline for much of their beekeeping. Instead it would often be wise to begin looking at the hive itself and understanding what the bees are telling us. Below is an excellent article by The Obee Reardon on reading the frames and observing what the bees are saying, what they are doing, and what they need. Enjoy! There’s a well known saying: “A picture tells a thousand words.” Beekeepers also have a saying along the lines of going through a hive is like reading a book, the bees are telling you what’s going on on each frame. So what does this picture of a frame tell me? And is it a thousand words? When I first started beekeeping I never smoked my hives. Somehow, somewhere I had learned that it was terribly difficult to smoke your hives correctly without burning the bees or some other weird idea. I had some strange fear that it would be a little like operating a hand held dragon. I’m not sure how that got into my head but it caused a ton of issues for me and thankfully I eventually started smoking my hives when doing inspections. While you certainly can operate without smoking your hives it means putting new boxes, lids and other items onto the hives very slowly, pushing each little bee out of the way. If you don’t you’ll squish a lot of bees and while unlikely, one of those could be the queen. Eventually I fired up the smoker and realized that it really isn’t difficult to use. The trick? Let the fire die down before you start pumping the bellows. You don’t want burning dragon fire coming from your smoker but it’s easy enough to avoid. That’s really all there is to it. If you’re at all paranoid you can simply blow the smoke over your bare hand… if it only feels mildly warm to you it’ll be just fine. But why do we smoke our bees? There are several thoughts as to what a smoker causes bees to do. First many think that bees respond to smoke as they would a forest fire, gorging themselves on honey so they can fly off to a new home should they need to flee the hive. Second the smoke is said to mask the warning pheromones given off by guard bees, keeping the troops from hearing the battle cry. So how do you best use the smoke in your hives? Well first you can use smoke to push bees where you want them to go. When I first used the smoker this was really helpful when it came to adding new boxes to the tops of my hives… pushing them away from the top of the box meant very few if any were squished when I put on the new box. The same idea holds true when it comes time to put on the inner cover. But don’t smoke them too much! Pushing them around a bit is fine but if you use too much smoke it won’t work for you. Why? Because if they are surrounded by smoke they won’t be able to “move away” from the smoke but will instead simply walk around disoriented. Not what you were hoping for when you lit up the smoker! So use smoke sparingly and both you and the bees will be happy. Final thought. If your beehives aren’t at your home (or even if they are) you have a burning thing you need to transport and/or store. Make sure the fire is out before you put it anywhere and as an extra added precaution get a metal box with a lid if you need to put your smoker in your car. We don’t want to see you on the news with a smoking car! Found this over on Twitter. Thought is was fun. Whether laziness or cleverness, Pooh considers the shortest distance to accomplishing his goals. There are many reasons we find ourselves “having to” or “wanting to” move bees. The “have to’s” might occur when a neighbor complains they are bothering the children or the hive is not in the right location. The “want to’s” might be moving bees to fulfill pollination contracts or to take advantage of different nectar flows. 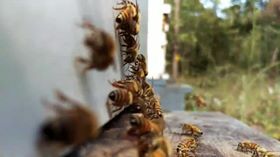 Whatever the reason, moving bees, whether a few feet in the backyard or across several thousand miles, is no easy task. Not only is it hard work (hives are heavy), it’s also a bit intimidating to think about picking up a box with hundreds, no thousands of insects that when disturbed or agitated, will become stinging agents of pain. Since this can be a tricky job, let’s talk about how we can move hives without harming the bees or more importantly, ourselves. But Wait!! Stop the Presses!!!! Placing hives in the right spot, the first time, will save a lot of headaches, backaches and work down the road. So, before we ever move in the first hive of bees, let’s consider the following things.